The Te Deum is printed before any other part of the Office in a pre-Tridentine Ambrosian Breviary, because of the tradition that it was composed by Ss Ambrose and Augustine on the occasion of the latter’s baptism; it is here described as a “hymnus dialogicus - a hymn sung in dialog.” King David appears below as the author of the Psalms, Isaiah as the author of the first canticle sung at Sunday Matins, and Daniel as the prophet in whose book the Benedicite appears. A few notes about the organization of the book, which may be helpful to those who are interested in perusing it. The calendar is followed by a series of indexes and tables. The Office begins with the Te Deum, as described above. even though when it is said, it is at the end of Matins. 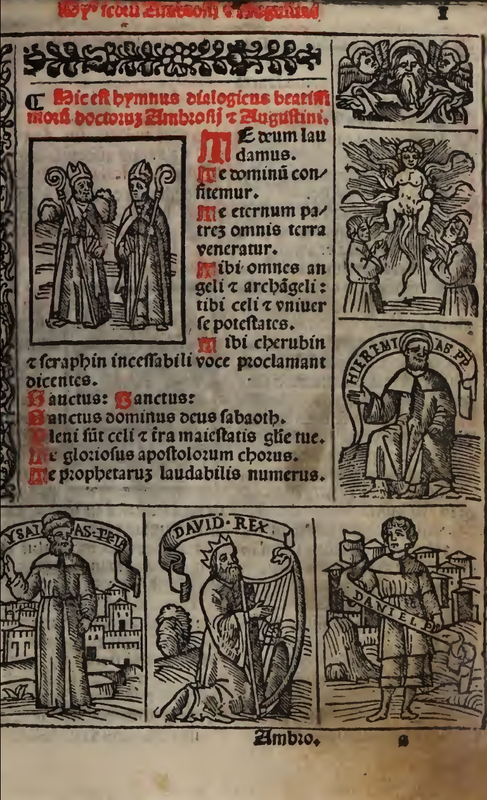 The Psalms are then printed in their Biblical order, which, as in the Roman Rite, is not quite the same as the order in which they are used liturgically. The Ambrosian Rite has Old Testament canticles, not Psalms, at Sunday Matins, so the liturgical Psalter therefore begins with Monday Matins. Psalms 1-108 are divided into ten blocks called “decuriae,” which are said from Monday to Friday over two weeks. The Psalms of Vespers (109-147) are interrupted by Psalm 117, which is said at Lauds on Saturday, and Psalm 118, which is said from Prime to None as in the Roman Rite. 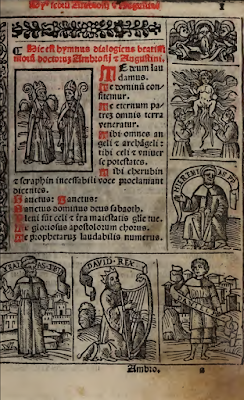 (This spectacularly inconvenient habit of printing the Psalms in canonical order was very common in written breviaries of the Middle Ages, as well as the early printed editions, and continued in Dominican Breviaries until the end of the 19th century.) 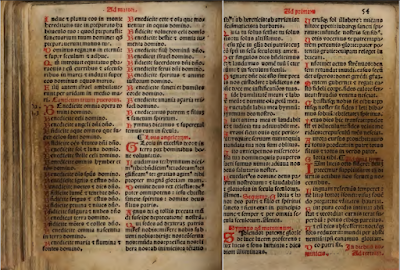 There then follow the hymns and canticles in the order in which they are used from Matins to Compline; as one might imagine, using such a breviary required a great deal of flipping back and forth, and it was for this reason that most breviaries were completely reorganized after Trent. As an interesting side note, the nocturn of Saturday Matins begins with the canticle of Moses in Exodus 15. Psalm 118 is divided into four parts, two of which are read after this canticle on a two-week cycle. (1st week, verses 1-48 and 49-88; 2nd week, verses 89-128 and 129-176). The Ambrosians therefore read the longest Psalm in the Psalter 7½ times a week, where the Roman Rite has it only 7 times, and they have a two-week Psalter which is nevertheless longer than the older Roman one-week Psalter. On pages 53v-54r (152-153 in pdf format), one may note the Laus Angelorum, which is similar to the Gloria in excelsis of the Mass, but with several interpolations and verses added to the end. This was sung at Lauds on Sundays and feast days, but suppressed in the Borromean reform; it has been restored to optional use in the Ambrosian Novus Ordo. There follows an Ordo, and then the Propers begin with St Martin on November 11th, since the six-week long Ambrosian Advent begins on the Sunday after his feast day. As was often the case with the liturgical books of this era, the Offices of the Season and those of the Saints are mixed in together, not separated into two distinct parts. The common Offices of the Saints then appear at the back. 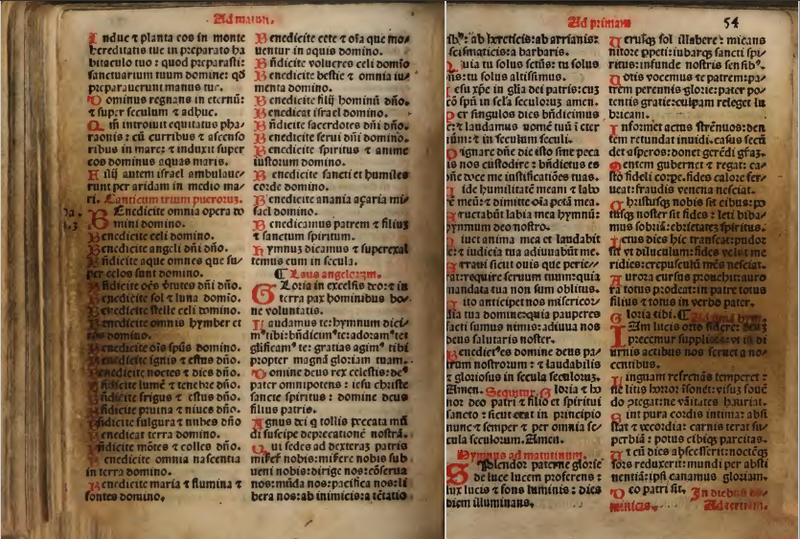 An historical footnote: none of the Ambrosian liturgical books printed before the days of St Charles Borromeo was an “official” edition, including this breviary. 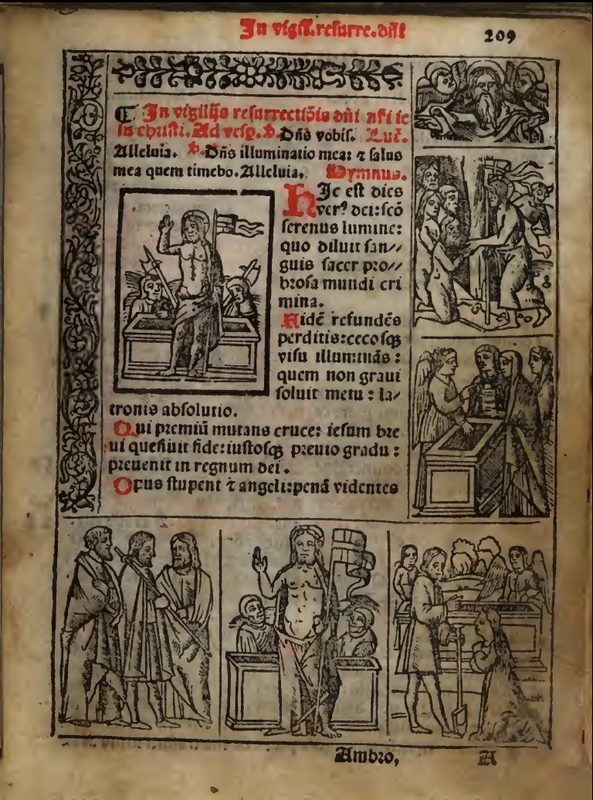 They were printed solely at the private initiative of printers who hoped to sell them, or individual members of the clergy who commissioned them, but they were not ordered, edited or given any official sanction by the archdiocese of Milan or its cathedral or curia. At the time that St Charles became archbishop in 1560, Milan had not had a resident archbishop in eighty years, which is to say, for most of the period since movable type had been invented. 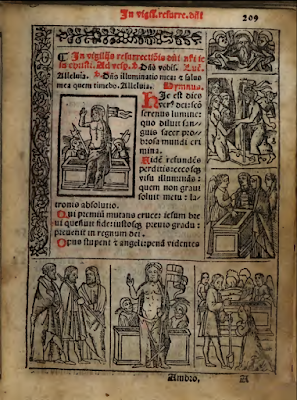 Among the many things which he did to bring order and discipline to the diocese, and to preserve the Ambrosian tradition, was to arrange for editions of the major liturgical books to be produced after careful editing and revision; the first such official breviary was printed in 1582. Thanks to our Ambrosian correspondent Nicola de’ Grandi for bringing this to my attention!